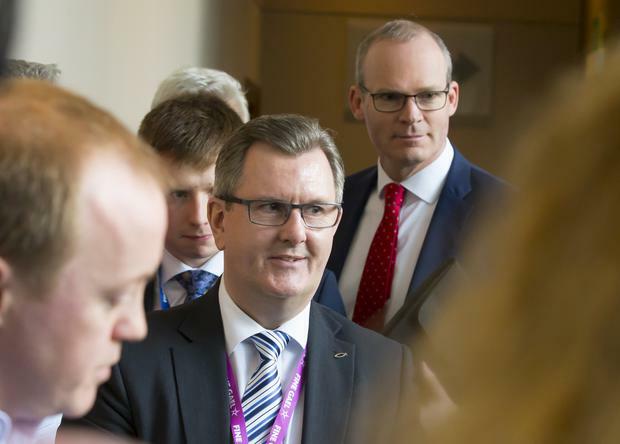 A SUGGESTION from the DUP’s Jeffrey Donaldson that Ireland should join the Commonwealth was met with applause at Fine Gael’s National Conference. The Northern Ireland politician said Ireland would benefit from part of the group which is primarily made up of former territories of the British Empire. “I do hope we can come to a day when the Republic will join with many other nationals in the Commonwealth nations recognising that we have overcome a lot of adversity. “It would be good, the Commonwealth is a place where Ireland’s voice should be heard and I would like to see that happen,” Mr Donaldson said. He made the comments while sharing a stage with senior representatives from the SDLP, Alliance party and Tánaiste Simon Coveney. Asked for his views by reporters afterwards, Mr Coveney said joining the Commonwealth was not on the table. He claimed delegates clapped because they were “wanting to show some warmth towards Jeffrey Donaldson”. The idea of Ireland joining the Commonwealth is frequently raised by Fine Gael senator Frank Feighan – but Mr Coveney said there is “probably not” a majority to support it within the party. “It’s not something that’s on my agenda,” he added. By Alex Green, Press Association Charles Dance has thrown his support behind Tyrion Lannister to emerge as king of Westeros.